A team from Luleå University of Technology will represent Sweden in the ActinSpace innovation competition. 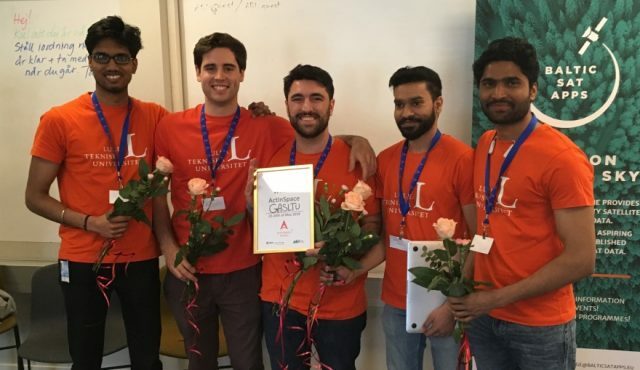 The team won the Swedish competition – a 24-hour hackathon. – This challenge has improved our team building skills and inter-personal skills. The challenge itself challenged our prototyping skills wherein we were able to come up with a functional prototype with a real time data dissemination and a webpage to display the data recorded, says Thasshwin Mathanlal, PhD student in Atmospheric Science and one of the members of the winning team. The winning team calls themselves Gasltu and consists of PhD students and a master student in Atmospheric Science. In June, they will travel to Toulouse where winners from 40 nations meet in the final. At stake is an experience of weightlessness with an AirzeroG A310, pilot training in an Airbus 320 simulator and access to satellite data of earth observations. During the 24-hour hackathon, the teams worked on challenges within the realm of patents, software or space infrastructure. The LTU team chose the challenge called AIRBUS04 – Create new concepts of small satellites or payloads for Airbus satellites and drones. They had to invent a payload that had business potential, something worth building and commercialize. The team proposed GASPAC (Group of Atmospheric Sciences Payload Assembly for Citizens), a scalable, low-cost and easy implementing (plug-and-play) payload, made of commercial, off the shelf components. The payload can be integrated into civil Airbus drones for improving existing remote sensing services and at the same time, multiplying the existing markets where these drones are currently used. The challenge was then, in front of a panel of experts in business models, to prove that the payload was worth building. In addition, they built a 3D functional prototype and a website to show the data acquired in real time by the payload and the user interface they were proposing for a hypothetical service to customers or researchers, such as precision agriculture, pollution and health services. What are your expectations regarding the final in Toulouse? – The main focus of our finals would be to win the Airbus Grand prize, who would miss a chance to be on a zero-gravity flight? Says Abhilash Vakkada-Ramachandran, PhD student in Atmospheric Science. – We really want to defend our solution as good as possible. We all share the spirit that if you do something, whatever the context is, you should always do your best, and that is what we will definitely do in Toulouse as Swedish representative in the competition. It will be hard, we will compete against 35 countries, but still we believe in ourselves. The team was lead and adviced in the competition by chaired Professor Javier Martín-Torres, Professor Maria Paz Zorzano and Associate Senior Lecturer, Doctor Anshuman Bhardwaj. ActinSpace is an international innovation contest initiated by the French Space Agency supported by the European Space Agency, ESA, and the ESA Business Incubation Centres network.